In 2015, Iraq War veteran Josh Geartz had survived two suicide attempts and was planning a third. Just two weeks before the date he’d chosen to take his life, Geartz found out about an innovative nonprofit, Songwriting with Soldiers. The organization gives veterans a way to tell their stories and create connections by pairing them with professional songwriters at Loudoun’s Boulder Crest Retreat and other locations around the country. 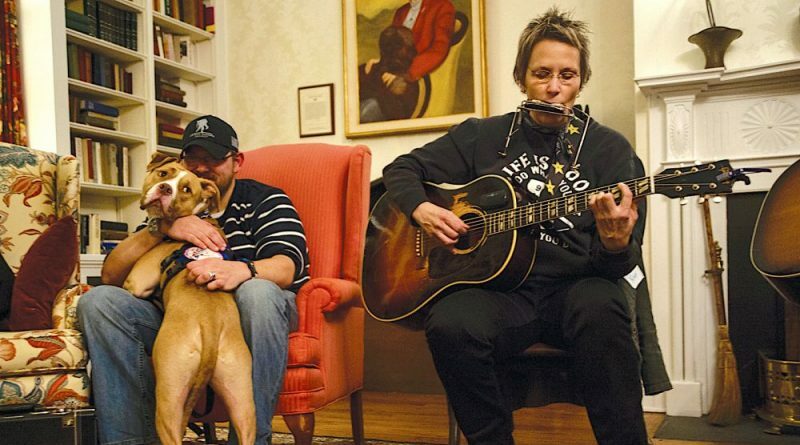 Geartz, who was injured by a roadside bomb in Iraq in 2004, attended his first Songwriting with Soldiers retreat in upstate New York that year, working with noted singer-songwriter Mary Gauthier. A few weeks later, Geartz was onstage playing harmonica with Gauthier at the Grand Ole Opry’s 90th anniversary celebration. His song “Still on the Ride” is included on Gauthier’s new album “Rifles & Rosary Beads,” which is nominated for best folk album at next month’s Grammy Awards. Geartz has since become a regular volunteer for Songwriting with Soldiers. Now walking independently after seven years in a wheelchair, Geartz is training to walk from New York City to Buffalo this year to raise funds for the organization. As a Songwriting with Soldiers partner, Boulder Crest Retreat in Bluemont has hosted a dozen songwriting retreats, with more in the works. The latest Boulder Crest album, featuring five veterans and their spouses from November, is available at the Songwriting with Soldiers Bandcamp page. The Nashville-based Songwriting with Soldiers was launched in 2012 by songwriter Darden Smith and program director Mary Judd, whose background is in communications, education and psychology. Darden and Judd have recruited top songwriters like Gauthier and Nashville-based Jay Clementi, whose repertoire includes Luke Bryan’s hit “Move,” to work with veterans, soldiers and military family members. 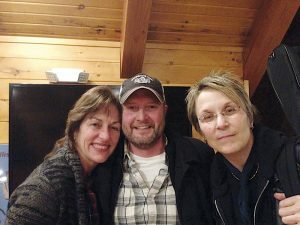 From left, Songwriting with Soldiers co-founder Mary Judd, veteran and volunteer Jamie Trent, and songwriter Mary Gauthier. A typical Songwriting with Soldiers retreat at Boulder Crest features three or four songwriters and eight to ten participants, Judd said. The event usually kicks off with a Friday evening concert and time for participants to get to know each other. Saturday brings an intense day of songwriting and creativity workshops and ends with a moving performance of the veterans’ work. “It’s a powerful experience,” Judd said. The Songwriting with Soldiers team carefully selects participating songwriters for their ability to listen and be supportive while helping participants express themselves, Judd said. Clementi has been involved with the program since the first retreat in 2012 and has written with more than 60 veterans, soldiers and family members. By starting a dialog with participants, Clementi helps them hone in on slivers of experience that will make for a meaningful song. Both Judd and Clementi underscore that the Songwriting with Soldiers songwriters and staff are not trained therapists. But for Geartz, that was exactly what he needed. His work with Gauthier, starting in 2015, gave him something doctors and therapists could not. “Mary doesn’t have a code of conduct or a way of doing things. She can just be a person, and I think that’s really all I needed is just that connection with somebody,” Geartz said. Geartz, who lives in near Buffalo, NY, has since attended Boulder Crest’s intensive Warrior PATHH program and said that Boulder Crest and Songwriting with Soldiers are the two nonprofits that have had the biggest impact on saving his life. “They have thought of everything. 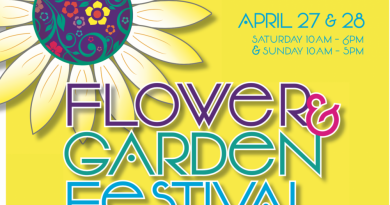 Every single thing that they do, there’s a purpose and a reason behind it,” Geartz said. Geartz’s wife of 15 years, Lisa, is also a veteran and has recorded several songs through organizatino, including the moving “Army of One” recorded with songwriter Terry Radigan in 2016. Both organizers and veterans stress that musical ability is not required to take part in the program. Judd says that 90 to 95 percent of the veterans and spouses have no musical experience, and that the songwriters supply all of the musical skill required. Jamie Trent, of Lynchburg, is one of the handful of participants who came into the program with a songwriting background, but his involvement with the nonprofit has helped hone his creativity and give back to other veterans. Trent, who served in communications on an aircraft carrier during the Persian Gulf War, has been involved with the nonprofit since attending his first retreat in 2013. 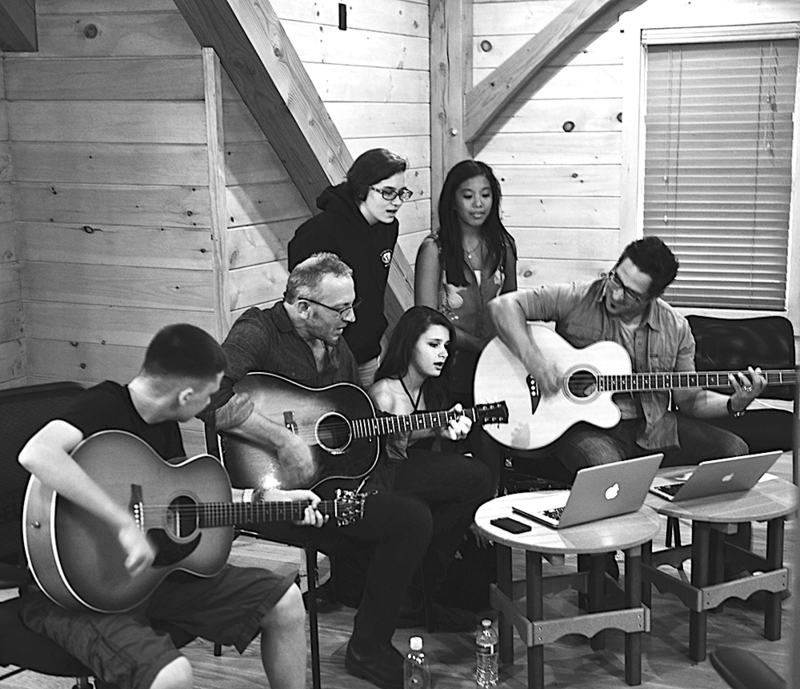 Songwriters Jay Clementi, right, and Darden Smith, center, work with teens at a Boulder Crest family retreat. Like many of the veteran-written works, Trent’s songs often focus on the aftermath of war and ongoing struggles on the home front. Trent, who now works as a sales manager in the automotive industry, survived two heart attacks a decade ago while still in his early 30s, and learned about his best friend’s suicide while still in the hospital. That experience led to his powerful song, “The List,” written in collaboration with professional songwriter Gary Nicholson. Trent regularly volunteers at Boulder Crest, in addition to writing songs, both through Songwriting with Soldiers and on his own. Like Geartz, connecting with other struggling veterans has become as much part of his healing as the songwriting. Learn more about Songwriting with Soldiers and listen to works by Josh and Lisa Geartz and Jamie Trent at songwritingwithsoldiers.org. Find more information about Boulder Crest Retreat at bouldercrestretreat.org.